Round 4: Steve vs. Amy in "Ticket to Ride"
It's been a little while since I've posted an updated list of scores in our "Steve vs. Amy" Ticket to Ride games. Having a baby will do that, I guess. We actually still have been playing, but I haven't spent the time to blog about the scores, so it's time to play catchup. For those just tuning in for the first time… whenever we play a head-to-head game, we update the ongoing results table on our guest bathroom wall, which features chalkboard paint. Our guests are always quite amused when they take a look! (Previous Updates: Round 1, Round 2, and Round 3). 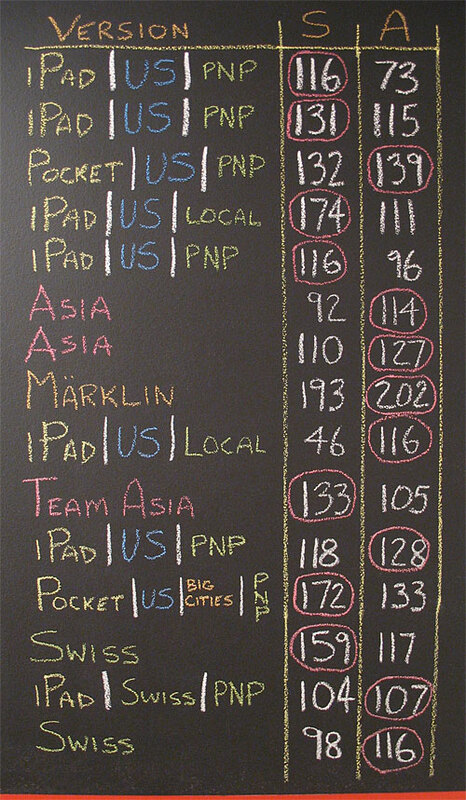 Right off the bat, you'll notice a high abundance of digital games played, both on iPhone and iPad. These were played during our time at the hospital while Amy was giving birth to Wesley. 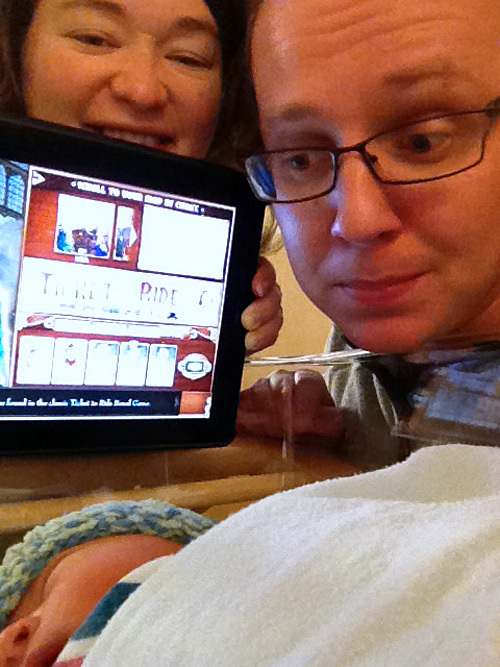 Here's a look at a shot from the recovery room where we are attempting to brainwash our son in the ways of Ticket to Ride while he was just 1 day old! Around the same time that Wesley showed up, Ticket to Ride Asia showed up, featuring a 2-sided board. The first side features "Legendary Asia" (which I refer to as just "Asia" on our score chart). The other side contains a unique 6-player "Team Asia" version, designed for teams of 2. Amy & I tried playing the team map with normal rules, just for fun. It worked pretty well if you adjust the number of trains to non-team levels back down to individual quotas. In this latest round, we played a total of 15 games, with Amy winning 8, and myself the victor in 7. It's obvious she figured out the new Asia map pretty quickly, but I dominated the electronic versions (a little foreshadowing… that changes quickly as Amy starts to play a lot of Ticket to Ride on the iPad during 3 a.m. feedings!). Factoring all rounds since we started keeping track of these statistics, Amy leads the series with 33 wins to my 29. US – The original version of Ticket to Ride, which features a United States map. Europe – The 2nd game in the series, Ticket to Ride Europe. Swiss – As previously mentioned, the out-of-print Ticket to Ride Switzerland map. Nordic – One of our favorite maps, Ticket to Ride Nordic Countries, which covers Scandinavia. Marklin – Basically, Ticket to Ride Germany. This version of the game was released in conjunction with largest model railroad company in the world, Marklin. Asia – Ticket to Ride Legendary Asia, Side #1 of the "Map Collection #1" expansion from Days of Wonder, debuted in 2011. Team Asia – Ticket to Ride Team Asia, Side #2 of the "Map Collection #1" expansion from Days of Wonder, designed for teams of 2 up to 6 players. Mega Game – This refers to an expansion that adds additional Destination Tickets. When used in conjunction with the US acronym, it refers to the USA 1910 Expansion. If you see it mentioned with Europe, it refers to the Europa 1912 Expansion. Mystery Train – The very first expansion to Ticket to Ride, which can only be used with the original US map. Now out-of-print, but you can download and print it for free. W&D – Short for "Warehouses & Depots", part of the Europa 1912 Expansion, but a feature that can be added to ANY Ticket to Ride map. Allows you to create a stockpile of Train Cards that you can access later in the game. A&D – The Alvin & Dexter Monster Expansion, which can be added to ANY Ticket to Ride map. It's an affordable must-have. Ghost/Ghost 2 – A fan-created set of rules called the Ghost Train, designed to tighten up the USA map for a 2-player game. The number refers to how many Ghost Trains were in play at the time. Pocket – Ticket to Ride Pocket, a stripped down version of the game for the iPhone and iPod Touch. Currently, just the USA map exists in this digital version. iPad – Ticket to Ride for iPad, which comes with the default US map (though allows you to purchase the 1910 expansions, Europe, and Swiss maps). PHP – Short for "Pass 'n Play", the idea of playing a game on a mobile device where you pay it back and forth between players as you each take your turn. Local – Multiplayer for an electronic version of the game enabled via a local Wifi network. In our case, we played a game with one of us using the iPad and the other using the iPhone, thus you didn't need to take turns with the device (in contrast to Pass 'n Play mode).